Best Sonos deals: The best prices on Sonos speakers | What Hi-Fi? Sonos has made the multi-room market its own with a range of excellent wireless speakers, soundbars and companion amplifiers. Even as new competitors such as Bluesound fill the market, Sonos remains a solid bet for anyone wanting wireless music around their home. Sonos deals don't come around too often, but there are some discounts across the range - including £70 off the Playbase and even £30 offthe outgoing Gen 1 version of the Sonos One. So if you were thinking of taking the plunge and buying a Sonos speaker, now might be the time. Ignoring its predecessor below, the Sonos One is the cheapest Sonos wireless speaker - and now it's even cheaper. The reason for the official price drop to £179 is that the first-generation models are being sold low to make way for the Gen 2 version, which is also available now at the original price of £199. The differences between the two are slight, though: the Gen 2 gets Bluetooth Low Energy (BLE), an updated processor, and increased memory, but that's it. We therefore reckon it's the perfect time to grab a great-sounding, Alexa-toting One with a 10% saving. The Play:1 was the original small but beautifully formed Sonos speaker. Now usurped by the One (above), it remains an accomplished performer, certainly where sound is concerned, but doesn't offer the bells and whistles (mainly voice control) that you find on the Sonos One. Thanks to its relatively age, you can save a few quid. Like the majority of Sonos's wireless speakers, the Play:3 is another cracking performer and is now available with a tidy saving. No touch sensitive controls or voice assistants, but all the control and streaming functionality of the Sonos family. The biggest, boldest and most powerful speaker in the Sonos range, the Play:5 can fill even the biggest room with a rich, powerful sound. Some new rivals might beat it on pure audio performance, but as an addition to a Sonos system, it's still great quality. 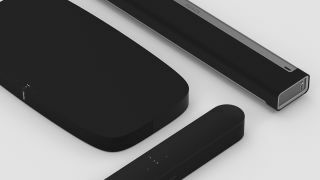 The Beam is the latest smart speaker from Sonos and the first to add an HDMI connection. This means it's ideal for boosting the sound from your TV, while also giving you all the familiar Sonos features. Voice control is here, too. At this price, it's a bargain. If you’re looking for a simple device that will massively improve the sound from your TV (as opposed to a bona fide surround sound set-up) and give you immediate access to more music than you could ever possibly hope to listen to, the Sonos Playbar is an excellent option. If you prefer a soundbase to a soundbar, then the Playbase is your only option where Sonos is concerned. Luckily, it's a pretty good option. There's an impressively big, wide soundstage, solid, natural bass and a stylish, solid build. The treble can be a bit edgy when it gets really loud but it's still a fine buy, particularly with the current, £70 discount. The Connect can turn any home hi-fi into a Sonos streaming system, simply connect one of these clever boxes to your amplifier and you're in business. It's a great way to bring Sonos smarts to a traditional music system - and upgrade your sound in the process. Much like the Connect, the Connect: Amp is all about bringing Sonos to traditional two-channel systems. You've probably guessed the difference; this one has its own amplifier, so you can connect straight to a pair of speakers. The Connect:Amp has now been superseded by the Amp below, so likely won't be available for long. On the plus side, there are now some useful discounts around. Like the Connect:Amp, the all-new Sonos Amp is designed to offer all of Sonos’s streaming smarts in a unit you can add any hi-fi speakers to. Around the back of the just-add-speakers Amp you’ll find all of the connections of the Connect:Amp – two pairs of speaker terminals, a subwoofer output, two ethernet sockets, and a stereo analogue input. But there’s one important addition: an HDMI socket, which gives the Amp all of the TV-partnering features of the Sonos Beam, including automatic switching to TV audio when required and volume control via your TV’s original remote.